One of Fukuoka's best-known shrines is Kushida, founded in 757. It is situated in the heart of ancient Hakata with a huge gingko tree, said to be 1,000 years old, shading its forecourt. 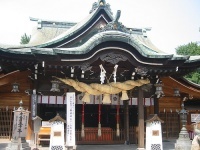 The shrine honours the grand deity, Ohata Nushina-mikoto, and was built during the Heian Period for the common people. Today it is very much enjoyed by locals and visitors alike during the summer's major event, the Hakata Gion Yamakasa Festival. On the last day of the festival, the Kushida Shrine becomes the starting point for this fun run where hundreds of young men clad only in loin cloths carry heavy wooden shrines through the streets along a set route, vying to clock the fastest times. The shrine itself contains several items of interest, particularly the Eto Arrow plate bearing carvings of the Chinese zodiac and a brace of anchor stones, recovered from the harbour, that were once attached to ships of the Mongolian invasion fleets. The Hakata Historical Museum is also situated in the shrine grounds, which are pretty and well-kept. There is lots of shopping and many food stalls to enjoy in the area and the shrine complex is great for a stroll, a rest, some meditation, and some historical sightseeing.